…Studer und Frey haben einen Grad von Dichte erreicht, der sie bei aller Freiheit zu einem schon fast verschworenen Duo macht. Umso dringender sind diese Aufnahmen, die zeigen, wie gut sie auch mit andern Musikern funktionieren können, ja inspiriert werden und der Pegel an Präsenz und Energie hochbleibt. Zur Qualität der Musik auf den beiden CDs gehört, dass sie nicht konstruiert, sondern vor Ort erfunden wurde. Studer und Frey brauchen kein Studio, um ihre Musik zu finden. Sie ist immer schon da, wenn sie spielen. Was sie wollen, wie sie es machen, warum es so klingt und wann es passiert: Das ist real time zu hören. Sie komponieren intuitiv und agieren präzis. Sie sind der Musikfisch, der aus den Händen schwappt, wenn du ihn fassen willst. Mit ihren illustren Gästen haben sie ein ganzes Meer durchschwommen. Silence and space are a consistent presence over the music here which ranges from trios (the majority of music here) to quartets to a septet (both bassists and 5 guests). 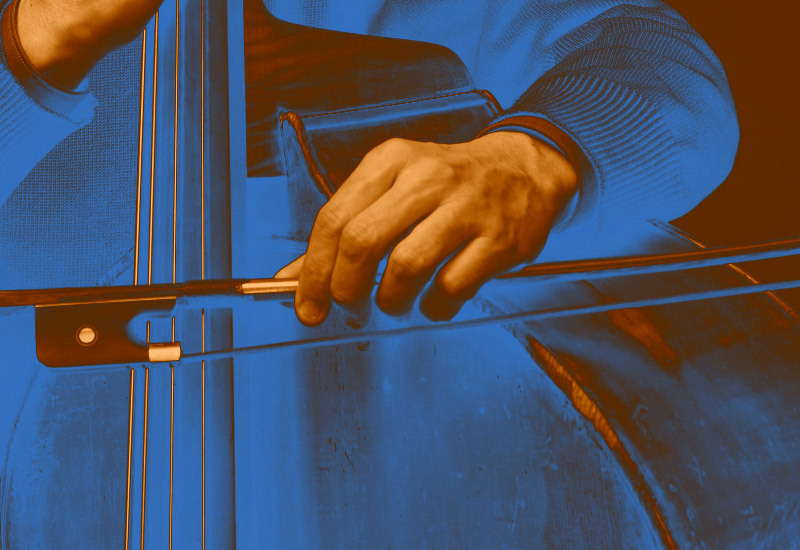 I found this to be surprisingly successful, the bassists gives a consistency to the performances which as a whole have no consistency and the guests give it variety in the constant of freeform improvisation. Fans of minimalist improv should embrace these efforts and get hours of good and satisfying listening adventures. …è dunque la summa delle impostazioni dei due contrabbassisti svizzeri, poiché qui si passa in rassegna la concezione di 15 anni di tecniche e collaborazioni, non solo ottenute nello scambio interpersonale ma anche relazionandosi all'attività improvvisativa svolta con i partner privilegiati: coerentemente organizzati, i due contrabbassisti dispongono del loro ampio bagaglio timbrico per tutti i musicisti che li hanno accompagnati in questi anni, offrendo un saggio della loro bravura in soluzioni tecniche adatte … In tutti i casi queste lunghe elucubrazioni che sembrano appartenere alla terra di nessuno, sono stati sensitivi che esprimono un mondo subdolo, stratificazioni di suoni non leggibili in prima istanza che tuttavia hanno una propria logica del raggiungimento: è un'officina dei suoni che va immaginata come un dialogo in totale estraneità delle regole del linguaggio corrente, a cui però bisogna fare attenzione per scoprire le proprietà finissime dei climax comuni alle specificità di un'opera d'arte astratta. Voici quinze ans que le duo existe. Pour célébrer cet événement, ils ont invité toute sorte de vieux compagnons. Non pas pour jouer tous ensemble, mais pour s’offrir des plages de liberté, souvent longues, qui se laissent le temps. Le double album Zurich Concerts voit défiler une impressionnante dream team de la musique improvisée.… avec Gerry Hemingway est le sommet de ces concerts, et nonobstant ses plus de vingt minutes, on en voudrait davantage car cet échange est fort intense. Le percussionniste se niche au pic de la tension au sein du duo pour mieux exacerber les passions. C’est sans doute la meilleure des raisons pour se procurer cette remarquable collection de timbres qui dit beaucoup de la vitalité de la musique improvisée européenne. What a wonder! Somehow I was expecting to hear two bass players, simply. I hadn’t read the sleeve-notes. 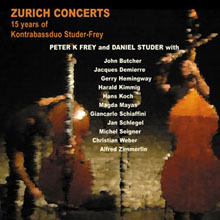 Instead, Studer-Frey indulged me with more than two and a half hours of improvised music executed by a variety of combinations of musicians, with instruments chosen from bass and electric bass, bass clarinet, cello, electric guitar, percussion, piano, tenor saxophone, trombone and violin. In short, a most enjoyable concert of improv that was jam-packed with the most musical of surprises. Such is the gamut of sounds generated that even if improvised music is your thing, you may find that it takes time to fully embrace the riches on offer here, because it is truly penetrating music, no one piece seemingly having anything in common with any other. Possibly due to vagaries of my copy of the CDs or the recordings, I found the whole more pleasing when played at a higher volume than I would normally employ, but it was not excessive and not a problem. Many thanks to Kontrabassduo for a truly remarkable experience. The resulting sprawling scrums tend to be slowly paced, murky soundscapes with the occasional glimmer of something like a solo. There’s an overwhelming serious cast to these mildly animated and occasionally ponderous collective ruminations. Though not without many felicitous moments when listening to the scrapes and bounced bows of the principals and the contributions of their widely varied guests, I strongly suspect that Frey and Studer’s music is much better experienced in the place and moment of its creation. That way, you’d get to experience the intensity of their interactions as enacted on the stage and reflected in the audience. Until you get a chance to see Frey and Studer for yourself, the extensive documentation of this two-CD set will have to suffice.